Children as young as 11 were held in police cells in England and Wales in 2011 because officers thought they were mentally ill, the BBC has learned. The Mental Health Act lets police take anyone they suspect of being mentally ill in "need of care or control" to a safe place for assessment. The figures, revealed for the first time by a Freedom of Information request to police, show that two forces locked up one child each for more than 24 hours. Children detained by police had not necessarily committed any crimes. Places of safety referred to in the Mental Health Act will usually be in a hospital, care home or any other suitable place but, in exceptional circumstances, it may also be a police station. This detention may only last up to 72 hours. In the case of children, places of safety could include adolescent psychiatric units or children's homes but, if a place is not available locally, they can end up in police cells. Lucie Russell, campaigns director for mental health charity Young Minds, said: "We're almost treating them like criminals and punishing them for their distress and vulnerability. "Putting them in police cells is really only going to make them worse - it will exacerbate feelings of paranoia, delusions and extreme fear and distress." "I think it's a reflection of what's happening in society in terms of pressure on services that we're having to resort to this and that the police are having to deal with young people in this way," she added. Some 35 out of 42 forces that provided data in England and Wales held children under 18 in custody under the act last year. South Wales constabulary was unable to retrieve its data. Acpo's Simon Cole said that, in some cases, it was right to detain children in cells because they were violent but that provision for young people in some parts of the country was patchy. "It's quite clear that, in some places, police officers who are finding vulnerable young people at a point of crisis have no realistic option other than to take them to cells," he added. "I don't think that anyone looking at that situation would think that that's the best answer." He said arranging out-of-hours support for young people could take "quite some time" which led to children being put in police cells "until somewhere better is found for them to be placed". 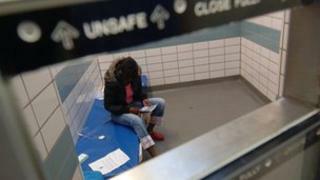 The government plans to have diversion services - to assess and treat children and adults who have committed a crime before they spend time in custody - by 2014. The Ministry of Justice is working with the Department of Health and the Home Office to pilot and then introduce the services in police custody suites and criminal courts. Health minister Norman Lamb told the World This Weekend on BBC Radio 4: "To place youngsters in police cells is completely unacceptable in all but the most exceptional circumstances. "There may be some limited circumstances where a youngster, perhaps for their own safety, just has to be placed somewhere - but this must be the absolute exception, not the rule. We need to ensure that they are put into the right places for youngsters of that age. "I suspect that this practice has always happened, and the fact that we can now expose what's happened so that we can actually bring this to an end I think is a good thing." Earlier, he said that £54m was being spent over the four years to 2014-15 on better mental health care for children and young people.